When it comes to taking medication the average child isn’t too inclined to take the dose. They may feel horrible, it taste awful, they have no control in the matter and it can lead them to feel an overwhelming sense of anxiety. I know as a mother how difficult this can be. My son used to freak out, cry and refuse to take the medicine that his sick little body needed. There are coping strategies that I used to use with the pediatric patients that I worked with in the hospital. One of which is called syringe painting. 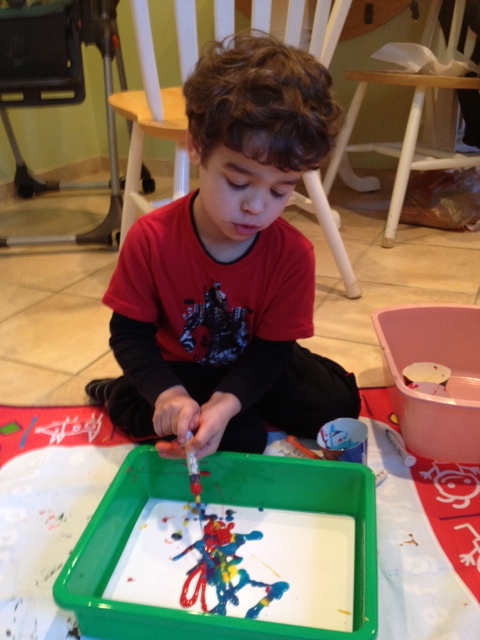 Syringe painting is a great way to help children play and express themselves through art by using a medical tool. Children can manipulate the syringe and play with it in a non-threatning way. They are able to become more comfortable with it and then begin to gain a sense of control over it. This is also a great tool not only for children who take medication orally, but for kids who have a chronic illness such as diabetes and are faced with insulin injections. It also works well for children who receive vaccines. Be prepared that your child may want to do it over and over again. This is normal and actually a great sign that your child is gaining a sense of control and processing what he/she has experienced. During the art session you can begin to have a discussion with your child in regards to taking the medicine. Do they know why they have to take it? Do they understand what part of their body it is helping? Do they know the name of it? Do they know that it’s normal to be upset over having to take it and that it’s not a punishment? Offer the child as many choices that can be fulfilled. Do they want to take it standing up or sitting down? Would they like a popsicle or a lollipop? Would they like to have a count down or just get it over with? Lick a lollipop or popsicle before and after taking it. My son loves this idea and we make a fun game out of it by having him lick the popsicle until his tongue turns a different color and numbs/masks the taste of the medication. If its possible and the child would like to do it, have them squirt the medicine in their mouth. You can practice with water before. Advocate for Emla numbing cream. You may need to get a prescription or ask your pediatrician to put it on at least twenty minutes before the injection. I saw this when you posted it to Facebook, I cant wait to try it with David, he has been becoming so independent and wanting to give himself his medicine with the syringe lately! Great! He is growing up! Blake loves to play with the syringe. I noticed it dropped his sensitivity to take meds once I started giving it to him to hold and play with. Hi Brooke, I would respectfully disagree. The adult would dose the medication and then have the child hold the syringe, medicine cup or pill to place in their own mouth. It helps children have a sense of control.